A holiday in Villa Antriprà Apartaments in La Villa, Alta Badia, is always full of sports, discoveries, contacts with nature and active wellness. But first of all, of mountain charm and of the cordial hospitality of the Ploner-Peccei family! Here you’ll be immediately enchanted by the magic of the surrounding Dolomites, by the splendid view over the Fanes Group and over Sassongher, by the pure Alpine air that brings amazing fragrances from meadows and woods right behind the house, by roe deer and squirrels that you can sometimes admire just a stone’s throw away… It’s a unique experience, perfect to discover the most authentic side of Alta Badia. Numerous hiking and biking trails lead right from the doorstep towards Sassongher, the Gardenaccia massif (part of the Nature Park Puez-Geisler), Sompunt lake and lots of other stunning sites. But cultural attractions and tourist facilities are also close at hand. Though set in a quiet and panoramic location in the Funtanacia district of La Villa in Badia, Villa Antriprà Apartments are just 1 km away from the centre of La Villa, from Piz la Ila cable car and from the ski slopes of Alta Badia. The nearest restaurants and bars are just 200 m away, the same applies to a public bus stop and to the sports area of La Villa with football and tennis fields, a big playground for children and a charming little lake. Finding an activity for every taste and age has never been so easy! All 3 apartments of Villa Antriprà in Alta Badia are designed with elegance and a pinch of traditional Alpine charm. In the interiors all leading parts belong to solid wood, that reveals its rustic beauty not only in floors and furniture, but also in some walls and in the characteristic wood ceilings with exposed beams of the apartments A and B. Every apartment of Villa Antriprà features TV/SAT, Wi-Fi connection and a kitchen equipped with electric hob, fridge, dishwasher (with appropriate detergents), drip coffee maker, cooking utensils, crockery and cutlery. All bedroom, bathroom and kitchen linen is provided and gets changed on a weekly basis. The house also offers a free private parking and a ski/bike storage with a ski boot dryer. In summer, at the guests’ disposal there is a garden with sun loungers. Laundry service is also available upon request (fee-based). 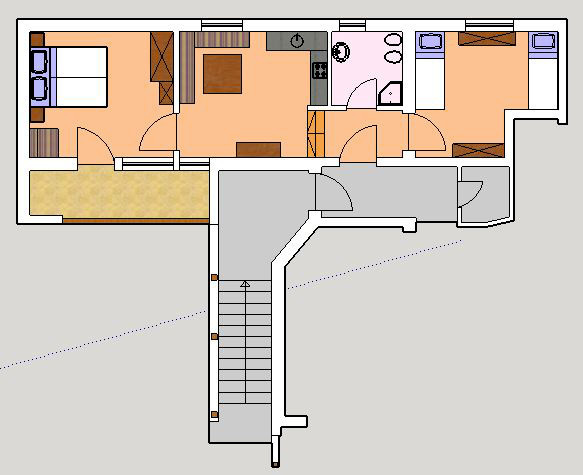 This apartment of Villa Antriprà in Alta Badia features 2 bedrooms: a twin one and a double one with a fold out chair bed that can be used for a child. The living room is composed of a dining area and a fully accessorized kitchen. The bathroom is equipped with shower, WC and bidet. The south-facing balcony offers a splendid panoramic view. 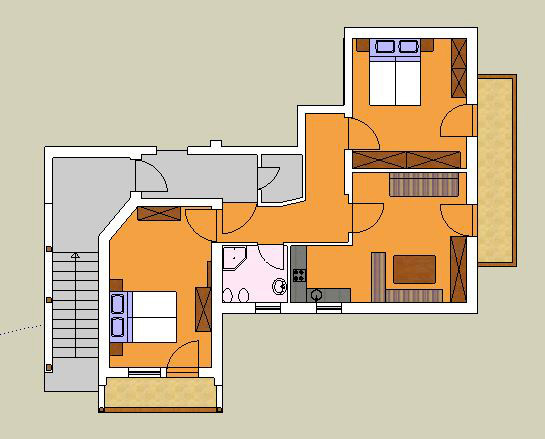 This apartment of Villa Antriprà in Alta Badia features 2 double bedrooms. 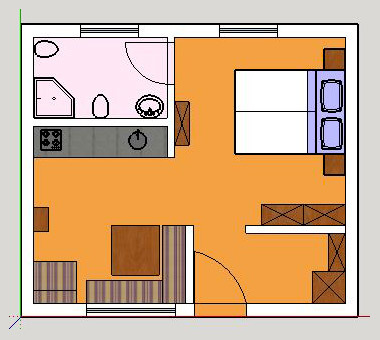 The living room is composed of a dining area, a double sofa bed and a fully accessorized kitchen. The bathroom is equipped with shower, WC and bidet. The apartment has 2 panoramic balconies with a splendid view over the Dolomites. This apartment of Villa Antriprà in Alta Badia is composed of a double bedroom connected with a living room featuring a dining area, a fold out chair bed and a fully accessorized kitchen. The bathroom facilities include shower, WC, bidet and hairdryer. The apartment is also equipped with a safe and has a direct access to the garden. The prices include: VAT, bed linen and towels with weekly change, outdoor private parking, ski/bike storage with a ski boot dryer, final cleaning. To the indicated prices will be added the local tourist tax of EUR 1.10 per person (over 14 years old) per day till 31 December 2017 or EUR 1.40 per person (over 14 years old) per day starting from 01 January 2018. All apartments are available from 12.30 p.m. on the day of arrival until 10 a.m. on the day of departure. We kindly ask our guests to inform us in advance, if the check-in is planned after 9 p.m. Upon departure, guests are kindly asked to leave their apartments clean and tidy. Whenever extra cleaning is required, we reserve the right to apply additional charges. To settle the final bill you can use cash (up to EUR 3000), bank transfer and bank cheques. Credit and debit cards are not accepted. Upon prior agreement, we accept pets, provided that their owners undertake entire responsibility for any damage caused by their pets. Smoking is not allowed in any apartment. Guests should inform the owners about all visitors if they don’t stay in one of the apartments of Villa Antriprà. Alta Badia has always attracted sportsmen, families, wildlife lovers, as well as gourmets. It’s a perfect destination to merge together nature and culture, to alternate physical activities with sweet moments of relaxation , to admire marvellous panoramas and to try new flavours. In winter, it’s real fun to rush down the perfectly prepared slopes of Alta Badia with skis or a snowboard and to explore the other areas of Dolomiti Superski along such spectacular ski tours as Sellaronda. Off-piste adventures include freeride, ski mountaineering, snowshoeing and sledging. But the choice of summer activities is equally wide: trekking and hiking, themed trails and adventure parks for children, road cycling and mountain biking, free climbing and fixed rope routes (via ferrata), as well as many others. Don’t hesitate to apply for information and advice to the owner of Villa Antriprà, Andrea, a qualified mountain guide. Besides, in any season, Alta Badia offers a plenty of cultural events and gourmet destinations, from Michelin-starred restaurants to characteristic mountain huts and typical Ladin farmsteads.